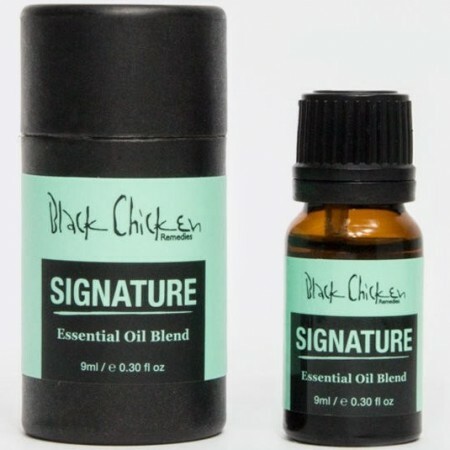 This is an Essential Oil Signature Blend, helping to reduce anxiety, as well as stimulating and promoting clarity of mind. Black Chicken Remedies aromatherapy oil aims to help the wellbeing and health of your body and mind. 9ml. Sandalwood - calms and reduces tension and anxiety. Geranium - balances mood and frustration. Patchouli - Soothes nerves and relieves stress by helping to release serotonin and dopamine. Lavender - calms and relaxes. Ylang Ylang - creates a calm mood. Carrot - enables deep relaxation. Santalum Spicatum (Sandalwood essential oil), Pelargonium Graveolens (Geranium essential oil), Pogostemon Cablin (Patchouli essential oil), Lavandula Angustifolia (Lavender essential oil), Cananga Odorata (Ylang Ylang essential oil), Myristica Fragrans (Nutmeg essential oil), Daucus Carota (Carrot essential oil).